Graduate students at New York University have overwhelmingly voted to boycott Israel in protest of its violation of Palestinian human rights. Exactly two-thirds of voting members of the graduate student union the Graduate Student Organizing Committee, or GSOC-UAW 2110, supported a referendum on Friday that calls for New York University and United Auto Workers International to withdraw their investments from Israeli state institutions and international corporations complicit in violations of Palestinian human and civil rights. At least 645 union members participated in the vote. An additional 57 percent of voting members pledged to uphold the academic boycott of Israel, refraining from participating in research and academic programs sponsored by institutions funded by the Israeli government. “After months of mass mobilization and a four-day election, GSOC members have taken a clear stand for justice in Palestine,” explained Shafeka Hashash, a member of the union’s Boycott, Divestment and Sanctions, or BDS, caucus. “This historic endorsement of BDS by GSOC at NYU occurs in the wake of growing momentum for the movement across university campuses and labor unions nationwide,” she added. 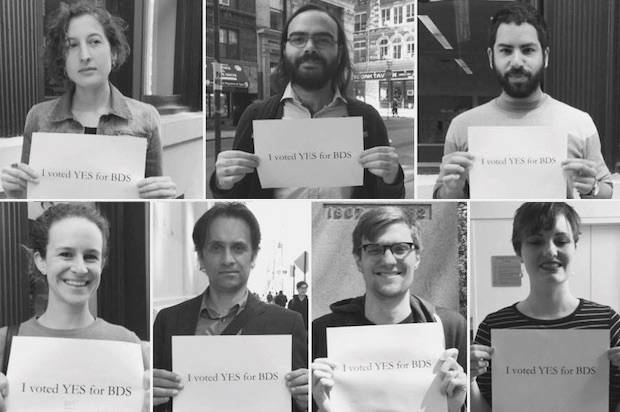 BDS is an international grassroots movement that uses peaceful economic means to pressure Israel into complying with international law and respecting Palestinian human rights. The campaign was called for by Palestinian civil society and by major trade unions in the occupied Palestinian territories. The Graduate Student Organizing Committee is a labor union representing more than 2,000 teaching assistants, adjunct instructors, research assistants and other graduate workers at New York University, or NYU. It is the first recognized graduate worker union at a private university in the U.S.
“In addition to bringing material gains for their members, NYU graduate students are reclaiming the union as a political platform for social justice causes,” explained Maya Wind, an Israeli activist and Ph.D. student at NYU who is a member of the union. The referendum also calls on NYU to close its sister program in Israel’s Tel Aviv University, which the union says violates its own non-discrimination policy. A recent U.S. State Department report acknowledged the “institutional and societal discrimination against Arab citizens of Israel,” as well as the unlawful killings, excessive force and torture people endure at the hands of the Israeli military in the illegally occupied Palestinian territories. The BDS movement is growing rapidly throughout the U.S. and the world. In the past week, at least two major graduate student unions voted to endorse a boycott of Israel. The Graduate Employee Organization at the University of Massachusetts Amherst passed a BDS resolution by referendum, as well as the City University of New York Doctoral Students Council, which approved an academic boycott measure overwhelmingly via vote. “The impact of NYU’s referendum will not only reverberate across private academic institutions where unionization efforts have gained momentum, but across the American academy more broadly,” GSOC said in a statement. At least eight major U.S. academic associations have voted to boycott Israel in protest of its violation of Palestinian human rights, including the American Studies Association, the American Anthropological Association, the Native American and Indigenous Studies Association and the Association for Asian American Studies. Many of these votes had resounding majorities in favor. Several national unions have also made similar votes, including the United Electrical Workers union. Despite the democratic nature of these votes, the efforts have faced huge backlash. Legislators around the U.S. are proposing bans on boycotts of Israel, which legal experts say is unconstitutional. When the University of California system’s graduate student union voted to endorse the BDS movement by a landslide in 2014, Salon exposed how the small pro-Israel opposition derailed the democratic process with the help of a prominent law firm that has defended powerful multinational corporations like Wal-Mart, Amazon, Apple and Chevron. Under this pressure, the United Auto Workers International Executive Board nullified the vote, even while admitting that it was thoroughly democratic. NYU’s graduate student union also says the UAW Local 2110 Executive Board “attempted to interfere with democratic elections to union leadership bodies.” GSOC condemned union executives for having “cracked down on their own membership” in an undemocratic manner. GSOC is pushing back against the backlash. “In the fight for social justice and against repression, the BDS movement and union democracy are natural allies,” the union affirmed in a statement. This entry was posted in Academic Boycott, Academic Freedom, BDS, U.S. Labor News, UAW 2110 (GSOC). Bookmark the permalink.